Row 1: Judith Armstrong Coleman ’64, Lynn Johnson, Susan Porter Jamison, Page Winfree Gorud, Mary Anne Baggaley Owen, Ann Ronald, Marylee Meyers Webbeking, Susan Lewis Ziemba, Dorene Osborne Johnston, Patricia Boll Stevens, Marilyn Chrisman Highberg, Barbara Shields, Janis Hartwell. Row 2: Karen Ott Owen ’66, Glen Owen, Donald Coleman, Steve L. Johnson, Packard Phillips, Barby Gloyd Smith, Kyra Dodge MacIlveen, Sally Heimbigner Jacobsen, Claire “Mimi” McLaughlin Caldwell, Mary Berger Chatfield, Karen Kidd Thomason, Frank Ziemba, Vic Walker, William “Bill” Hartwell III, Donald Shields, Marie Cook and Mike Rogers, Clay King, Janet Stewart Smith (in front of Clay), Joe Smith. Row 3 (begins behind Barby Gloyd Smith): Diana Yansen Wisen, Janet Whitacre Miller, Priscilla Alsip Lange, Sarah “Sally” Olsen Griffiths, Rob Thomason, Vic Webbeking, Lesley Allison and Pat Smith, Sally Clarke Landauer, Robert “Bob” Landauer, John Wells. Row 4: Roy Gorud, Linda Sloniker O’Brien Rice, Barbara Withers, Rob Woutat and Marilee Hansen, Ned Lange ’56, Karen McCormic Beierle, Ann Willard Watts, Adrienne Peterson, Lee Peterson, Angela Sutter, Carl Sutter, Nancy Greenawalt Washburn, Dan Lindsey and Susie Vinyard. Row 5: Patricia Forrest Huntsman, Chuck Owen, John Tastula, Gail Watterson Tastula, Jeanine Smith Johnston, Carol Markewitz, Margaret Keiter Lapic (behind Angela Sutter), Neil Buren, Tim Washburn ’60. Row 6: Henry Huntsman, William “Bill” Montgomery III, Rex Allison (right of center), Ernest Burgess, Bob Hough, Keener Boyce. Row 7: Collette Rothschild, Peter Rothschild, Tom Beierle, Lawrence “Larry” Meade, Carolyn Meade, Sue Wohlford, Denny Wohlford, Joy Moore. Row 8: Judith Gibbons Prindle ’62, Kirk Prindle, Ted Watts ’63, Jerry Hillis, David Jamison, Al McKee, Carolyn Reid, Joel Moore. Row 9: Paul Knostman, Maureen Kennedy, David Kennedy, Diana Gale (spouse of Jerry Hillis), Sally Kleve Moore ’62, Joann Nicon, Gary Saaris (spouse of Carolyn Reid). 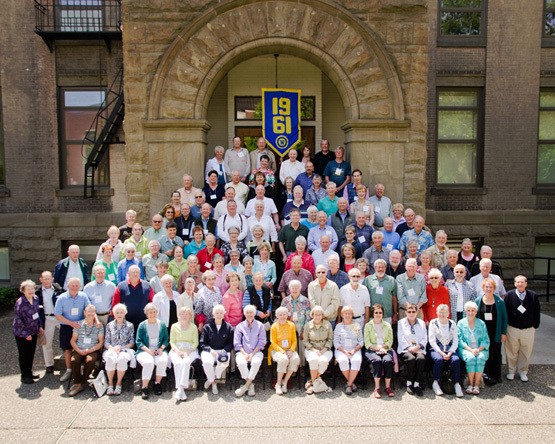 Row 10: Carolyn Ferrell, Donald Ferrell, Lance Jensen, Bobbi Day Jensen ’64 (in front of Lance), Jeff Moore, Janice Paget, John Nicon (in front of Janice), Edward Paget, Walter Highberg.